Nokia Lumia 630’s configuration of the processor was an amalgam of a Microsoft Windows Phone operating system 8.01 along with Qualcomm Snapdragon 400 chipset and a Quad-core 1.2 GHz Cortex-A7 processor. The phone featured 512MB RAM and the graphics on this unit were powered by an Adreno 305 GPU. The Nokia Lumia 630’s camera was a 5MP unit which featured autofocus, geo-tagging, and panorama. The lack of the secondary camera and LED flash is felt. The Nokia Lumia 630’s battery is a 1830 mAh unit that features a standby duration of up to 600 hours with a music playback time of 58 hours and a talktime duration of 13 hours 10 minutes. The Nokia Lumia 630 featured a 4.5 inch IPS LCD screen that had a screen to body ratio of 62.9% and the screen produced a display resolution of 480 x 584 pixels with a pixel density of 221 pixels per inch. The screen was protected by a Corning Gorilla Glass 3 unit. The Nokia Lumia 630 came with an internal memory of 8GB and featured a dedicated slot for expandable memory which could be expanded up to 256GB. The Nokia Lumia 630 price in India is priced under 10,000 rupees. This is a phone that has not been revamped after its release to match its competition. Hence, would not be a good buying option as the competition has come up with technology that is at least thrice to its at the same price. 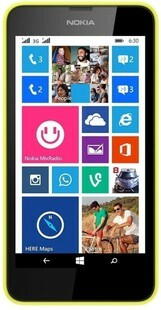 Nokia Lumia 630 full specs and reviews as of Apr 2019. Buy it here!